Not sure exactly when it happened, but most recently all of my battery powered Windows 10 devices are enjoying peaceful sleep in their respective bags. After installing Windows 10, they all experienced some quick draining which had me worried. But something has changed, and for the better. I’ll admit it, I’m a habitual meter watcher. From the second I unplug a device from its AC life support I start monitoring the battery meter, trying to understand the whats and whys of battery drain. Until our Wi-Fi routers start trickle charging our devices in a few years, it’s a dilemma we all have to face every day. Surface 3 – My S3 has enjoyed respectable standby and uptime battery drain since I powered it on the first time. The device was set to hibernate after 4 hours on non-use, which didn’t make everyone happy, but worked well for me. I typically don’t use my portable devices multiple times a day. Sometimes, when things get real busy, a device may not get out of my bag for two, or even three days. It’s important when I do need it for a task though, that the battery has enough juice to give me an hour or more of use. 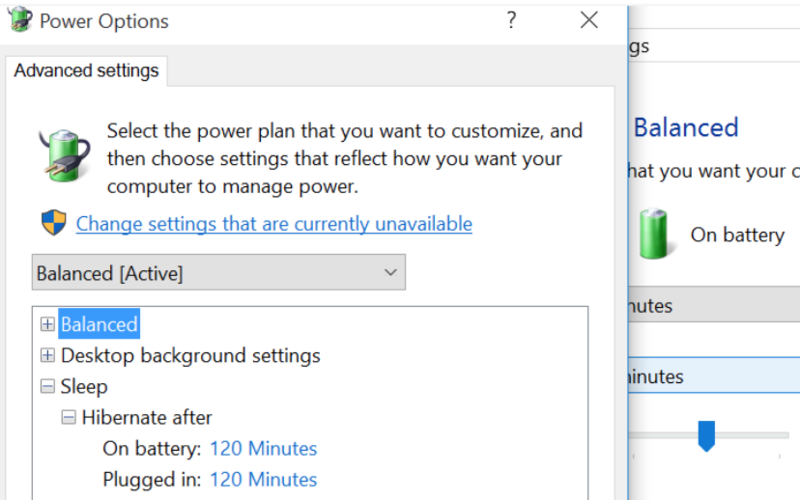 Right after upgrading to Windows 10, I noticed some unusual drain so I took a look at my Power Settings and discovered that I could adjust the hibernation time. I changed it from 240 minutes (4 hours) to 120 minutes (2 hours). Not sure how much that helped, or a subsequent update made the change, but now my battery is lasting a week or more with light use, as it should be. I currently have 30% remaining and can’t recall the last time I charged it. Maybe last Saturday or Sunday. Yes, when I turn it on after a day or two, I do have to wait about 18-20 seconds for my Surface 3 to get to the login screen. But the alternative is taking the device out of my bag after 3-5 days only to find it completely dead. If I used it extensively every day, I would turn off hibernation, and charge it every night. Options are good. They help to serve everyone and their unique needs. I’m experimenting with the below setting, “On battery power, stay connected to Wi-Fi while asleep”, on my S3. After initially disabling the setting, every time I woke the device it would not automatically connect to Wi-Fi. That’s especially frustrating as a user typically expects that a device “always” connects on wake, only to find after a minute that they can’t sync mail or get to the Internet because the connection hasn’t been established. Hopefully it was a bug that has been remedied in one of the recent Win 10 updates. Yoga Tab 2 – Like the Surface 3, right after upgrading to Windows 10, I found that the device had drained out within a couple days. Now, battery life has gone from miserable to incredible. I currently have 52% remaining since charging it last Sunday and using it a few times since then. There are no hibernation settings available on this device, so it wakes up within 3-5 seconds of tapping the power button. Even after several days. It is set to go to sleep on battery after 15 minutes. This machine was upgraded from Windows 8 w/Bing, but is currently running Windows 10 Home. The above Wi-Fi setting has been turned off since upgrading and I have had no problems connecting on wakeup. Maybe that has something to do with hibernation on the Surface 3, although that never happened pre-Windows 10. Yoga Pro 2 – This device is still part of the Windows Insider Program (slow ring), so not sure if there is anything different installed on this machine right now. Leading up to the launch of Windows 10, battery life was horrendous though. Although the device was supposed to be sleeping, it would only last a day or two in my bag, rather than the 10-14 days I was used to. Now, things appear to be getting back to normal. The YP2 does have a hibernate mode, but I discovered today that it was disabled. Further, I was surprised to see that Sleep was set to “Never” for both battery and plugged in. Despite that, I currently have 45% remaining after several days and some recent considerable use. I have changed Sleep time to 60 minutes and Hibernation to 120 minutes. That should make a good thing even better. How about you. What’s your battery life been like post Windows 10 upgrade? Come on, I know you’ve been checking. Next articleFlyin’ Ryan, Tell Me What to Buy! Classic Jimski right here. Love your battery articles (even though I of course still am the batteryboss).